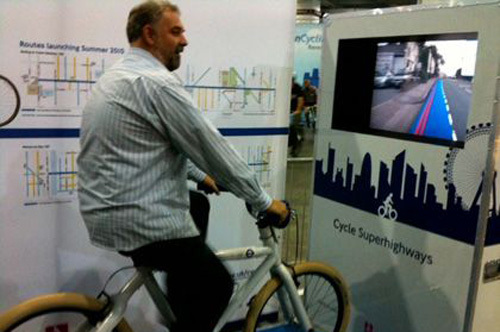 Requirements: Transport for London wanted an engaging interactive stand at the London Cycle Show to promote the upcoming Cycle Superhighways. Solution: Working with a colleague we created bespoke electronics that measured the speed of the rear wheel. These were fed into the application which controlled the playback of the video according to the users speed. The main content of the video was an overlaid path of the Superhighway and the planned roadside improvements. Users could stop pedaling to pause the video to read in more detail or turn the handlebars to affect the view.